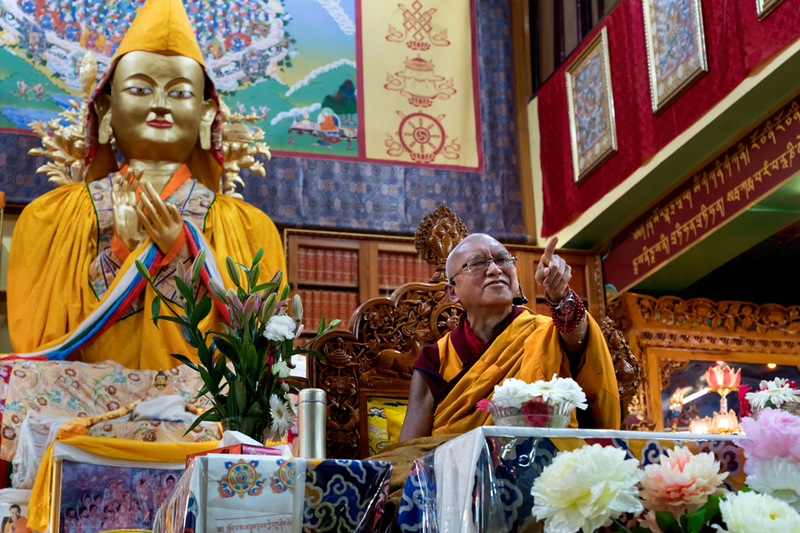 Lama Zopa Rinpoche teaching at Tushita Meditation Centre, McLeod Ganj, India, February 2019. Photo by Ven. Lobsang Sherab. … I escaped [Tibet] through Bhutan to Buxa [Duar in India]. For eight years I lived in Buxa. Other monks lived there for ten years then went to Bylakuppe and Mundgod. I received teachings from my gurus and took part in debating. Of course my study was like that of a little child. My study was just child’s study, so nothing much. So after coming back to Lawudo [in Nepal], reading the text of the Kadampa geshes’ advice on how to practice Dharma [Opening the Door of Dharma: The Initial Stage of Training the Mind in the Graduated Path to Enlightenment, a collection of advice by Lodro Gyaltsen] I checked back over my life. All those lives I checked back, which become Dharma or not, what became Dharma or not, what I did and whether it became Dharma or not. When I looked back by reading that text, nothing became Dharma. All those things I did didn’t become Dharma. I realized that nothing became Dharma. Then because of that I was able to clean my mind like you clean the room, like you clean the house of garbage—it makes the house dirty so you clean it out. I was able to clean my mind by reading that. Then I began the Vajrayogini retreat, my first time. So because of that, it was unbelievable, incredible, hard to believe the first day, hard to believe that if my life could be like this, my whole life could be like this. I couldn’t believe, incredible peace and happiness, peace was incredible, unbelievable, couldn’t believe the whole life could be like that. The retreat became really very pure because of having read that text and cleaned out the garbage of the mind. So the garbage is the eight worldly dharmas. This is an idea for you, if you want to do retreat, the best thing is to read this text. I gave teachings in Bodhgaya so there is book, what is it called? Student: The Door to Satisfaction. Colophon: Excerpted from Lama Zopa Rinpoche’s teachings at the Great Stupa of Universal Compassion, Bendigo, Victoria, Australia, April 8, 2018. Simultaneously transcribed by Ven. Joan Nicell. Lightly edited by Laura Miller, February 2019. From left, Ven. 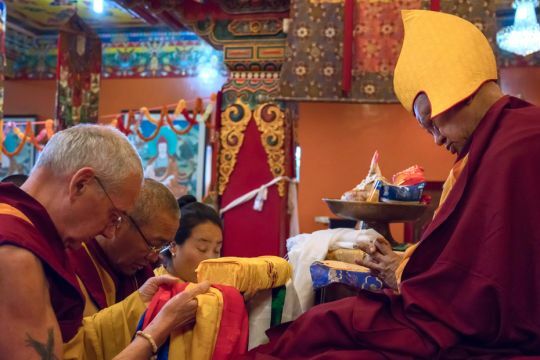 Roger Kunsang, Khen Rinpoche Geshe Chonyi, and Khadro-la making offerings to Lama Zopa Rinpoche during long life puja, Kopan Monastery, Nepal, April 2019. Photo by Ven. Lobsang Sherab. Every year, Ven. 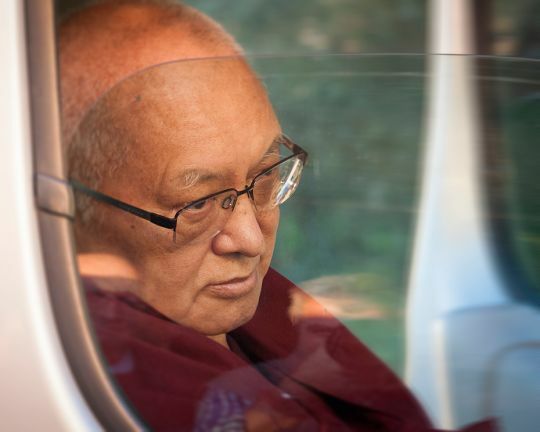 Roger Kunsang checks whether any practices need to be done to contribute to FPMT Spiritual Director Lama Zopa Rinpoche’s health and long life. 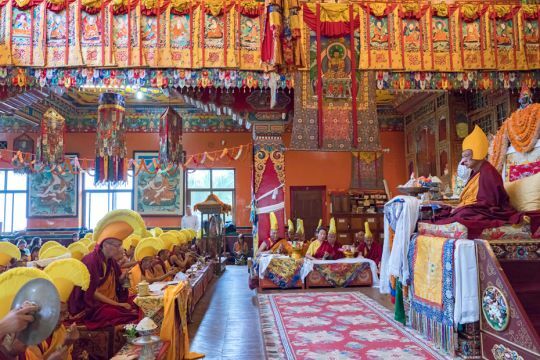 This year, Khadro-la (Rangjung Neljorma Khandro Namsel Dronme) advised that a Sixteen Arhat Long Life Puja, with additional recitations of Tendrel Topa, would be beneficial. 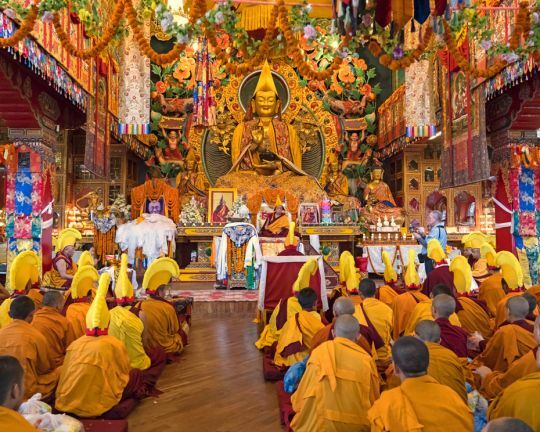 Long life puja for Lama Zopa Rinpoche, Kopan Monastery, Nepal, April 2019. Photo by Ven. Lobsang Sherab. On Saturday, April 6, the recommended long life puja was offered at Kopan Monastery in Nepal. Khadro-la attended the puja as did Dagri Rinpoche and Khen Rinpoche Geshe Chonyi, Kopan’s abbot who returned from Singapore to lead the puja. In addition to the Kopan community, many students from FPMT centers worldwide were also in attendance. Khadro-la, Khen Rinpoche, and Ven. Roger jointly offered Rinpoche a Vajrayogini statue in request for Rinpoche’s long life on behalf of the FPMT organization. His Holiness the Dalai Lama with Lama Zopa Rinpoche during a presentation on the activities of FPMT, Dharamsala, India, August 2018. Photo courtesy of the Office of His Holiness the Dalai Lama. 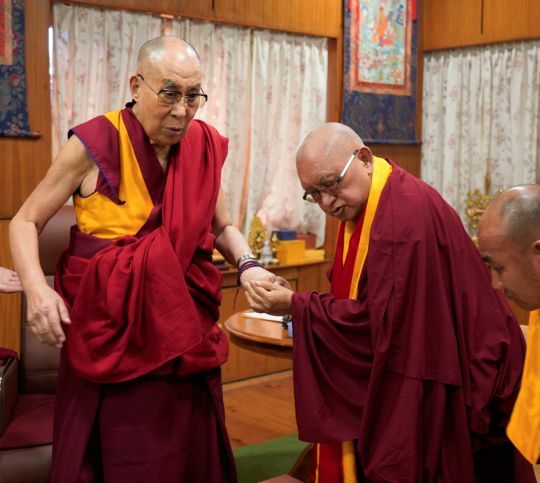 Earlier this week His Holiness the Dalai Lama was admitted to hospital in New Delhi, India, suffering from what seems to be a chest infection. 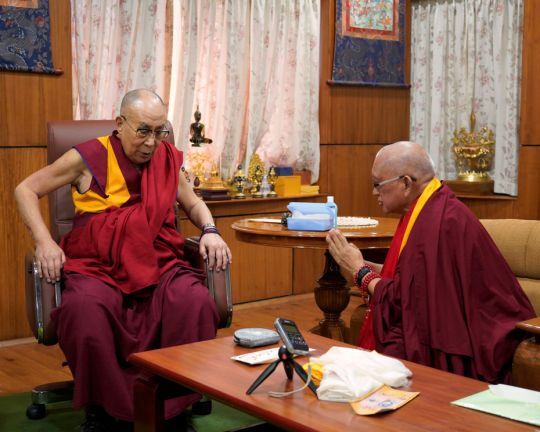 Tenzin Osel Hita, the recognized reincarnation of FPMT co-founder Lama Yeshe, sent a message to Lama Zopa Rinpoche, FPMT co-founder and spiritual director, asking if prayers or pujas could be done by all the FPMT centers for His Holiness, with some suggested practices. Lama Zopa Rinpoche checked and is advising all FPMT centers, projects, and services to please make tsog offerings, requesting for His Holiness’s long life and for His Holiness to be free of the present illness, and also to make tsog offerings to purify our own degenerated vows and samaya, and to hook realizations. In addition, Rinpoche advises to please liberate animals. His Holiness the Dalai Lama with Lama Zopa Rinpoche, Dharamsala, India, August 2018. Photo courtesy of the Office of His Holiness the Dalai Lama. Ven. 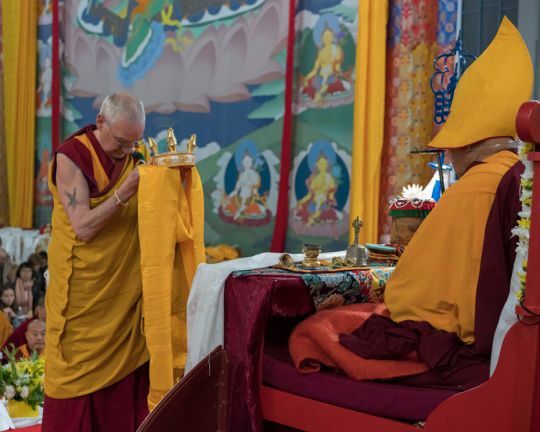 Roger Kunsang offering a mandala to Lama Zopa Rinpoche during the long life puja concluding the retreat at the Great Stupa of Universal Compassion, Australia, May 2018. Photo by Ven. Lobsang Sherab. During the 2018 retreat at the Great Stupa of Universal Compassion in Australia, Lama Zopa Rinpoche taught extensively on guru devotion. 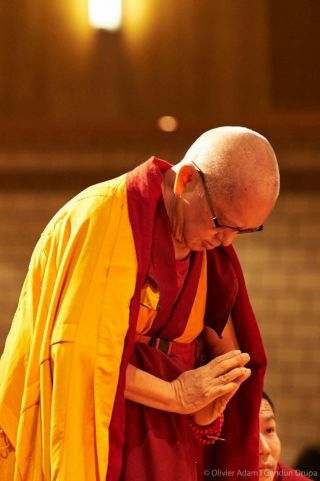 In the following, Rinpoche shares examples of quotes on guru devotion and concludes the half-hour video clip with a discussion of the proper motivation for listening to teachings. Without a guru you cannot be liberated from samsara. It is possible that many people who don’t know lamrim—who don’t know the essence of Dharma, lamrim, how to actualize the path to enlightenment, who do not know—would think like this. I think in particular many Westerners might think like that. They don’t understand about the guru. There are many people who think like that: you can do it without a guru. A boat cannot cross the river. KYA WA, the wood [oar]; KYA WA DZIN PA ME PA is “without a captain, the one holding that [oar].” “Without a captain, the boat alone cannot cross a river.” “Without an oarsman, the boat cannot cross the river.” You understand? That example is given. LA MA ME PÄI GONG RÖL NA / SANG GYÄ ZHE JÄI MING YANG ME: “Before the guru, there is no buddha, there is no name even ‘buddha.’” All the buddhas come from the guru. This is what the Buddha’s quotation shows. Therefore, one must cherish—hold on to the guru as more precious, more kind than the buddhas, than the ten-direction buddhas, the three-time buddhas, the numberless past, present, and future buddhas, all the numberless buddhas. Colophon: Excerpted from Lama Zopa Rinpoche’s teachings at the Great Stupa of Universal Compassion, Bendigo, Victoria, Australia, April 6, 2018. Simultaneously transcribed by Ven. Joan Nicell. Lightly edited by Laura Miller, March 2019. Lama Zopa Rinpoche circumambulating stupas and tsa-tsas at Kachoe Dechen Ling, Aptos, California, US, November 2016. Photo by Ven. Lobsang Sherab. Lama Zopa Rinpoche gave this advice to a student who said they had a new stupa in their house. 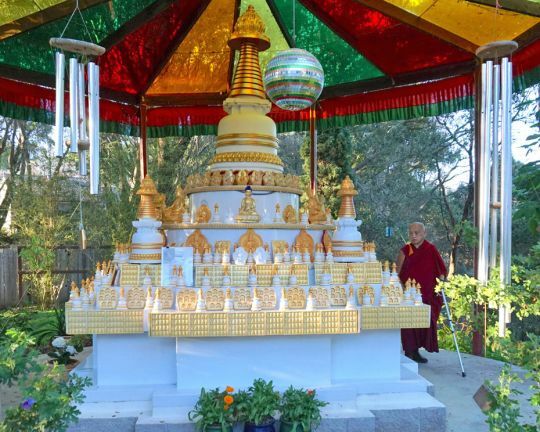 As this stupa was filled at Amitabha Buddha Centre (ABC), then it will have the Four Dharmakaya Relic Mantras inside. This is a Kadampa stupa, like what Lama Atisha used to carry, keeping the Guru’s hair, robes, and relics inside. When Atisha was on the road, even if a very subtle vice had been committed, he would immediately prostrate to the stupa and confess. This was how he used the stupa, for that purpose. Here I want to say this: you don’t have to put this stupa on your altar. Many times people don’t even look at the altar. So here, it is so important to see the stupa. Each time you see it there is great, great purification and that brings you to enlightenment; this is just by looking at the stupa. Therefore, it is better to put it in the kitchen or living room or on a table. If you have many stupas then you can put them on a table and also put other Buddha statues and texts (sutras such as the Vajra Cutter Sutra, Golden Light Sutra, Aryasangata Sutra, and so forth) then you can go around all these holy objects that are on the table. It makes it so easy to circumambulate them. This is a great thing. It purifies negative karma collected from beginningless rebirths that are obstacles to happiness—temporary and ultimate happiness—and especially to actualizing all the realizations on the path to enlightenment. And it creates the cause to achieve the path to enlightenment—to actualize the teachings that you have heard and read in your heart. 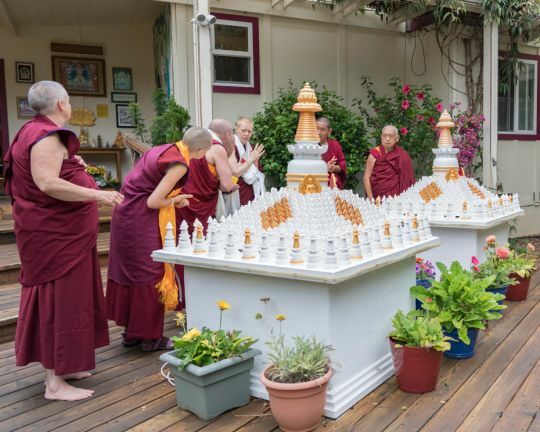 Rinpoche circumambulating stupas and tsa-tsas at students’ home in North Darolina, August 2016. Photo by Ven. Roger Kunsang. People who are non-believers can also go around the table with this stupa (and if you have them, other holy objects) on it while you are having a conversation with them. In this way even if your speech is non-virtuous, you can still collect unbelievable virtue with your body. And the non-believers also create the cause of enlightenment. There is great purification, and also one is able to collect merits. It is like the example of Jinpa Palgye (Shrijata). This is a story from the sutras. A long time ago he was a fly who followed the smell of cow dung around a stupa. That action became the cause in his life—when he was eighty years old—to begin to practice Dharma. He achieved renunciation from samsara. And by becoming free from samsara, he achieved the level of Arhat, free from samsara and the causes of samsara—delusion and karma. Not only non-believers, even when people from outside visit your house, they can also go around. If you have pets, such as dogs and cats, you can also bring them around the stupa that is on the table by holding them in your hands if you can, so they are at the same level as the stupa. Also if you find worms, insects, or flies in the house, or ants on your body—basically any insect that you find—you can catch them and put them in a plastic bag. Here at ABC they kindly made these insect catchers, which are two small boxes. One is called “method,” and the other is called “wisdom.” So you can put the insect in those, then take them around the stupa a few times, and then release them in a safe place. Or if you have a thousand ants or crickets in a plastic bag, then you can take them all around the stupa. This plants the seed of enlightenment in all their hearts, and there is great purification of heavy negative karma that has been collected from beginningless rebirths. Also they collect extensive merits. This is the best present from your side that you can offer them, as they are the cause of all your happiness from beginningless rebirths until now and also in the future. Every single happiness you receive from them. Beside that, they have been kind to you from beginningless rebirths. They have created so much negative karma in order to take care of you. They have suffered unbelievably, unbelievably, unbelievably for you and will do so again in the future, until you are free from samsara. Therefore, it is so important to be free from samsara as quickly as possible by actualizing wisdom directly perceiving emptiness. So for that you need calm abiding. For that you need pure morality, the three higher trainings, not only if you are ordained but also as a lay practitioner. Having the Four Dharmakaya Relic Mantras inside the stupa means it also has the Secret Relic Mantra inside. So if you go around the stupa with this mantra inside just one time, it purifies all the heavy negative karmas to be born in the hot hells, down to the eighth hot hell, the unbearable hell realm that has the heaviest suffering. All this gets purified and it makes it so easy to be born in a pure land or to achieve a perfect human rebirth with the eight freedoms and ten endowments, so one has the freedom to practice Dharma and to achieve enlightenment. When you go around the stupa you can recite OM MANI PADME HUM or other mantras, or if you have some commitments then you can recite them. Because if you sit down to pray then you go to sleep, but when you try to go to sleep, then you are fully awake, but not necessary fully awake in Dharma. One time in Kachoe Dechen Ling in California, our very precious kind Fabrizio [Pallotti] was in the same area and he was talking to me a long time on the phone. I was in my room and in that room I have a table that has many stupas, prayer wheels, statues, texts, relics, and images of buddhas on it. The table is similar to the altar tables I have in my room in Kopan and also in Dharamsala. The table is round and quite high and has many holy objects on it at a few different levels. You can go around the table. So as I was on the phone I thought to make the time worthwhile while I was talking, so I went around the table with all the holy objects. In this way at least I can collect merit and purify the cause of the lower realms and create the cause to be free from samsara, and also lower nirvana and achieve great enlightenment. By going around the holy objects, at least with the body, one can create virtue and the cause of enlightenment. 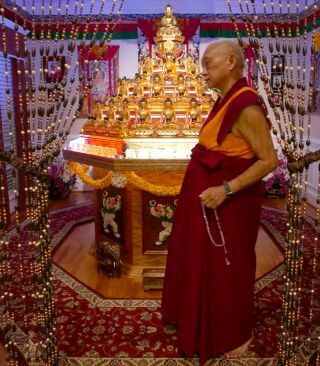 Rinpoche with Sangha next to stupas and tsa-tsas at Kachoe Dechen Ling, Aptos, California, US, August 2018. Photo by Ven. Lobsang Sherab. Also outside the office at Kachoe Dechen Ling there is a table set up with many Kadampa stupas and tsa-tsas,and a bigger stupa in the center. It is very neatly set up. So while Roger [Kunsang] and Holly [Ansett] are talking on the phone, which happens a lot, then at least they can go around and make the action of the body virtuous and create the cause of enlightenment. If you put this stupa on the dining room or living room table, it makes it very easy for people to go around every day, many people, so many times a day. It is so good to go around. So then you can rejoice at the end of the day, that at least there was some virtuous action collected. Then as many people spend a long time on the phone, while they are on the phone, they can go around the stupa. So it helps very much to not waste this most precious human rebirth. You can look at some photos of how I have set up the different stupas at Kachoe Dechen Ling. Also there is one Vietnamese family in North Carolina who has made a thousand Buddha statues, and they made an altar for the statues with many different colored lights. They go around every day, and also even their children go around by themselves as well. So because we have this perfect human rebirth—it is just one time, it is not sure how long we will have it, life is very short—I am suggesting this so as to not waste your most precious human life, which is more precious that the whole sky filled with wish-granting jewels, not only diamonds. Thank you very much. Colophon: Scribed by Ven. Holly Ansett, Kachoe Dechen Ling, Aptos, California, US, October 14, 2015. Lightly edited by Laura Miller, March 2019. Lama Zopa Rinpoche blessing chickens at Thubten Shedrup Ling Monastery, Bendigo, Australia, April 2018. Photo by Ven. Lobsang Sherab. During the 2018 retreat in Australia, Lama Zopa Rinpoche was asked, “What is the best way to develop bodhichitta?” You can read Rinpoche’s response in this excerpt from the teaching and in the following video clip. Many people think there must be some other way to develop bodhichitta. There must be some other way, not lamrim. There must be something special. Not lamrim, not lamrim! Something fantastic! Some other way. I say “renunciation.” My answer is “renunciation.” The more strongly you see your own suffering in samsara, then when you think of others, you have stronger compassion. You feel others’ suffering in samsara. Then also you have loving kindness for others. You want others to have happiness. And then you have stronger compassion for others to be free from samsara. For one to do that by oneself—to free all sentient beings from samsara and bring to buddhahood—one has to achieve enlightenment. To do that by oneself alone, then one has to achieve enlightenment. So how strong one’s bodhichitta is depends on the foundation—strong renunciation, strong compassion. When they are strong, then there is strong bodhichitta. In this southern continent there are all kinds of happiness, but there are all kinds of suffering. There is so much suffering that you can see, you can hear, so much in the world. The other worlds are not like that. Like the northern continent where everybody lives for one thousand years, nobody is poor, everybody is unbelievably wealthy. Everybody lives for one thousand years. So like that it is very difficult to get renunciation of samsara, so difficult to achieve compassion and bodhichitta. Here in this world it is much easier. You can see so much suffering. You can feel your own suffering of samsara more strongly. Then it is so easy to develop compassion and so easy to develop bodhichitta. It is said in Tibetan that due to karma, strong karma, it is easy to generate strong bodhichitta. So we are incredibly fortunate to be born in this time in the southern continent. We are so fortunate because of that. That makes it easy to achieve enlightenment. 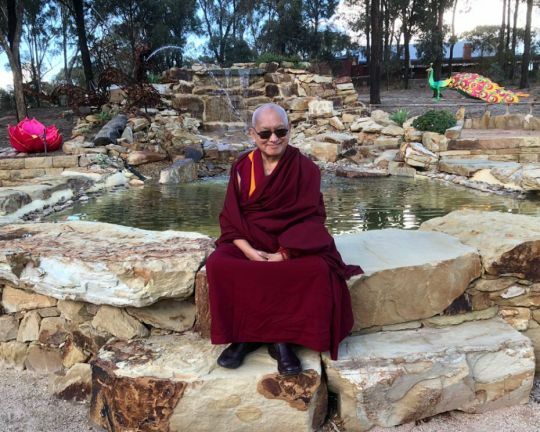 Colophon: Excerpted from Lama Zopa Rinpoche’s teachings at the Great Stupa of Universal Compassion, Bendigo, Victoria, Australia, April 10, 2018. Simultaneously transcribed by Ven. Joan Nicell. Lightly edited by Laura Miller, March 2019. Posted in Lama Zopa Rinpoche's Schedule. 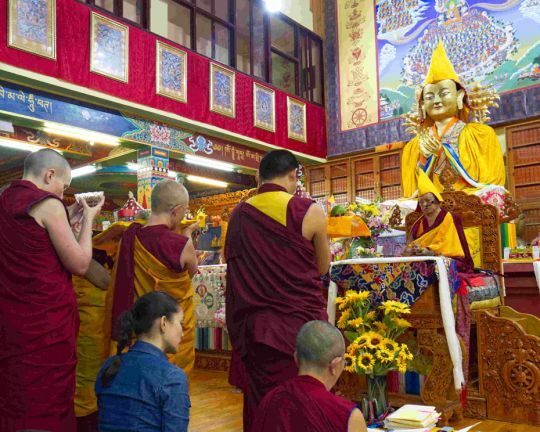 Tsog offering during Lama Chopa, Tushita Meditation Centre, Dharamsala, India, September 2018. Photo by Simon Houlton. … Yes, there are some people who have many obstacles when listening to teachings, and when they don’t meditate, then nothing happens. For some people it is like this, and it means there is an obstacle to practice. It is also very good to do mandala offerings. The mandala offering is very important and at the end of Jorcho preliminary practice, when you make the mandala offering, make a request for the three great purposes. I prostrate and go for refuge to the guru and the Three Rare Sublime Ones: please bless my mind. Please bless me and all mother sentient beings to immediately cease all the wrong concepts from disrespect to the spiritual friend up to the subtle dual appearances of the white appearance, red increase, and dark near attainment. Please bless us to immediately generate all the right realizations from respect for the spiritual friend up to the unification of no more learning. The first request is to pacify all the wrong concepts up to subtle dual view of the white, red, and dark visions, next is to generate all the correct realizations from guru devotion up to enlightenment, and the third request is to pacify the outer and inner obstacles. Outer obstacles are, for example, when you don’t have freedom and you are told by the king, the government or your parents to do something else, like go into the army or kill others, especially to engage in negative karma. Inner obstacles are diseases and also the delusions. Therefore, doing mandala offerings is very important in your life. Then dedicate the mandala. You have to visualize according to the commentary, that is best, and then you collect unbelievable, unbelievable merits, and you dedicate that merit to achieve these three things. That is very, very important, otherwise if you don’t do that, nothing changes. You should think these obstacles are good and that they arise because of the benefits of practicing Dharma. Think you are experiencing the past karma now; that your past negative karma is finishing. That is a good thing, it is the benefit of practicing Dharma. It is a good thing. It is very important if you can think that whatever problem you have, you are experiencing that problem for numberless sentient beings. You are experiencing all the suffering and the cause of the suffering—the delusions and karma—for sentient beings, so you receive that from them and then they achieve dharmakaya. This is unbelievable, unbelievable, most unbelievable purification and a quick way to achieve enlightenment. It’s a quick way to enlighten sentient beings, for them to achieve enlightenment. So mostly take the suffering. Also give your body as a wish-granting jewel, as numberless, so make charity to all those six-realm sentient beings. Then give your possessions and all your past, present, and future merits to numberless sentient beings, so they receive all the happiness. They receive the happiness of this life and of future lives, and ultimate happiness, liberation from samsara, peerless happiness, enlightenment, so they receive everything. Then rejoice. When you give your body, possessions, and merits as a wish-granting jewel, then everything becomes wish-fulfilling for all the sentient beings. The main thing is that they achieve all that happiness, liberation, and enlightenment. It is very good to do this as much as possible—taking other sentient beings’ sufferings and giving your happiness, your merits etc., to others. It is so good. Spend more time taking others’ sufferings, experiencing the suffering of others, the numberless sentient beings. This can change your karma. It is a most unbelievable, most unbelievable way to collect merit and a quick way to achieve enlightenment for sentient beings. This is most powerful purification, and it can change your karma the more you do it. 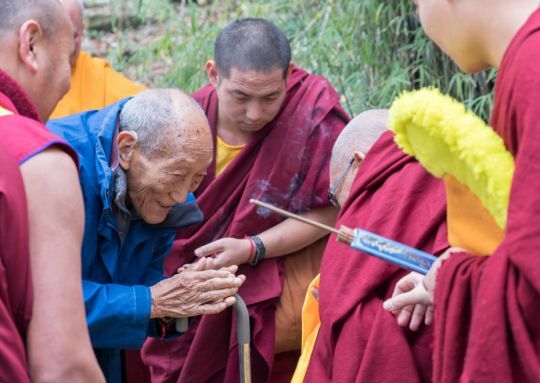 Lama Zopa Rinpoche greeting Khyongla Rato Rinpoche, who is 97 years old, before the long life puja offered to him at Tushita Meditation Centre, Dharamsala, India, February 2019. Photo by Ven. Lobsang Sherab. The usual thing is purification by Vajrasattva and so forth, but Vajrasattva is not the only one; there is Samayavajra in particular for the negative karma collected with the guru. But, as I mentioned, the most powerful is what the guru said to do, [to follow] the guru’s wishes, to do that. Pleasing the guru, as I mentioned, is the most powerful way to purify negative karmas and defilements, purifying the obstacles to realizing the path to enlightenment. Then, with compassion, with a sincere heart, doing hard work for sentient beings, like the bodhisattvas, doing hard work for sentient beings and doing hard work for the Sangha with a sincere mind, with devotion, a sincere mind. Those are the most powerful—as I mentioned yesterday, following the guru’s advice, pleasing the guru’s holy mind, as I mentioned the other night. Of course, Vajrasattva is known in all the four sects. It is common, but you don’t have to think only of Vajrasattva, “Oh, I need to do three months Vajrasattva,” to have the conditions for that. No, there are so many ways to purify. Lama Zopa Rinpoche arriving at the teaching venue during the 100 Million Mani Retreat at Istituto Lama Tzong Khapa, Italy, October 2017. Photo by Piero Sirianni. During a teaching given at the 2017 100 Million Mani Retreat held at Istituto Lama Tzong Khapa, Italy, Lama Zopa Rinpoche explains how we incorrectly see things. In the text it says that rabrib, or defective view, is like when you have a vision of hair falling down while you are eating food. There is no hair falling down, but you have a vision of that. It is like when you close your eyes—not totally close them, but close them a little bit when the sun is shining—and [it appears as if] there is all kinds of hair going around. So it is the same for rabrib. It appears to you, but it is not there. So that is the example. The I, action, object, six sense objects, forms, sounds, smells, tastes, tangible objects, senses, everything, even though it is merely labeled by the mind, it doesn’t appear to me or to you, it doesn’t appear as it is—merely labeled by the mind. Right now, it is merely labeled by the mind. Right before this second, it was merely labeled by the mind. But when it appeared to you, it appears from its own side, existing from its own side, as the real one. Everything—I, action, object, hell and enlightenment, sense objects, senses—as the Heart Sutra says, all that—elements, the four noble truths, the twelve links—so the real one appearing from there, never came from your mind, nothing to do with your mind. Not merely labeled by the mind, not even came from your mind, just from there. Do you understand what I’m saying? It is a total hallucination. It is decorated, projected there by the ignorance. It is exactly the same as the hallucinated rabrib. It appeared real, but it is not there. What appeared real to you, what you one hundred percent believe, is not there. This is the same, your daily life—your car, your house, Lama Tzong Khapa Institute—what you see as real is not there. It is the same as rabrib, as I described—what you see with eyes not completely closed, then you see all these things—but it is not there. It is like when you don’t recognize a dream as a dream. You believe it is real. You see a mirage, you believe the mirage is water, but there is no water. You understand? Colonphon: Excerpted from Lama Zopa Rinpoche’s teaching at Istituto Lama Tzong Khapa, Italy, October 13, 2017. Simultaneously transcribed by Ven. Joan Nicell. Edited by Nicole Parisi-Smith and Laura Miller, August 2018.